Our house in New Jersey has a backyard with a nice view. As all the neighbors refrain from putting up fences, we see each others’ yards and they merge into an unobstructed expanse of trees and grass. After a night of gentle snowfall, the landscape in the morning is tranquil and inviting. When Spring comes, the dogwood and azalea flowers liven up the backyard. It is a good vantage point to observe animals living among us. This piece of land happens to be on the grazing path of neighborhood deers. 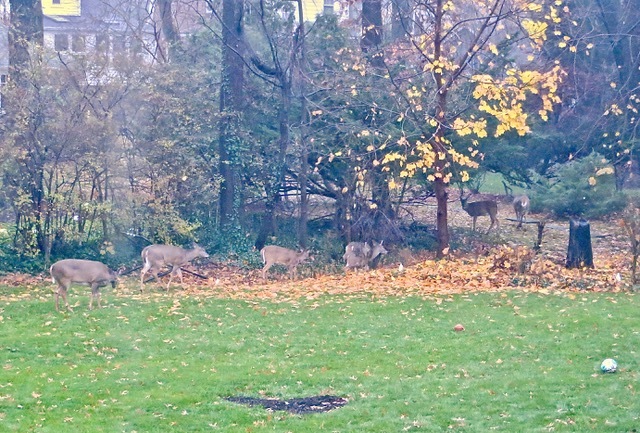 A herd of seven deers strolled through. 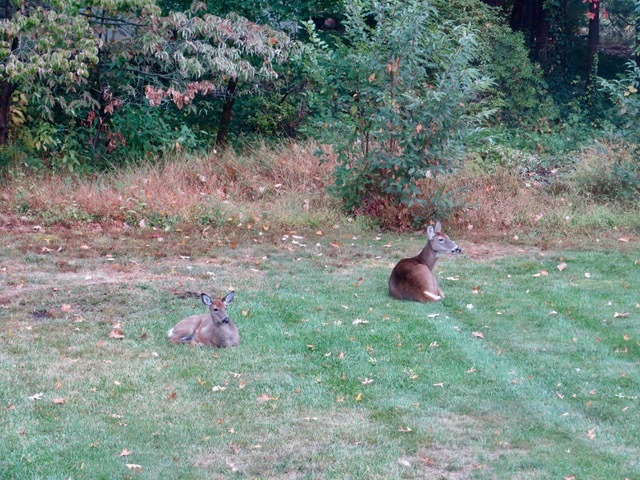 This family of doe and fawn felt comfortable to relax in our backyard. 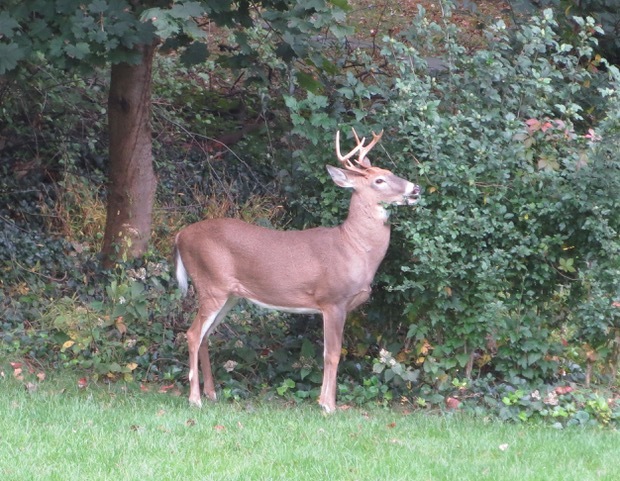 But the deers are insatiable eaters and destroy our flowers and shrubs. This buck munches new leaves. 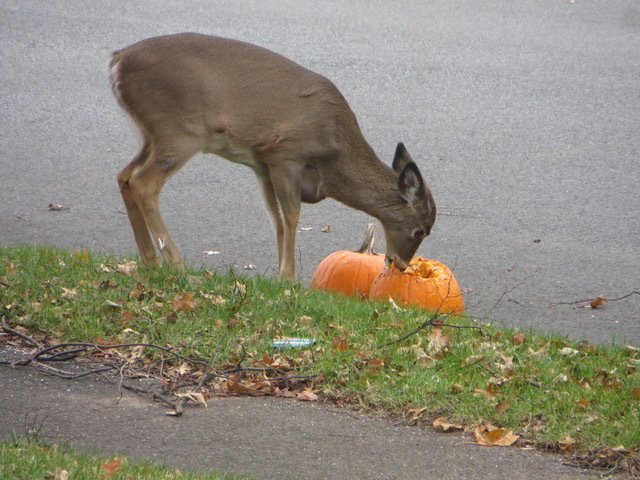 After Halloween, deers feed on discarded pumpkins. I protect our rose bushes with wire fences. But the 2-foot tall fences did not deter the taller deers. After a bush was devoured, I replaced the fences with 4-foot tall wire mesh. I hope after the wire loses its shiny luster, they would be less conspicuous and blend into the background. 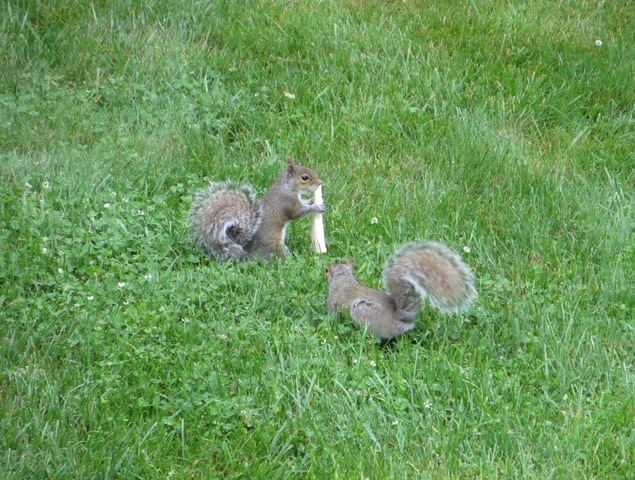 Squirrels scamper on the lawn and all over the trees. 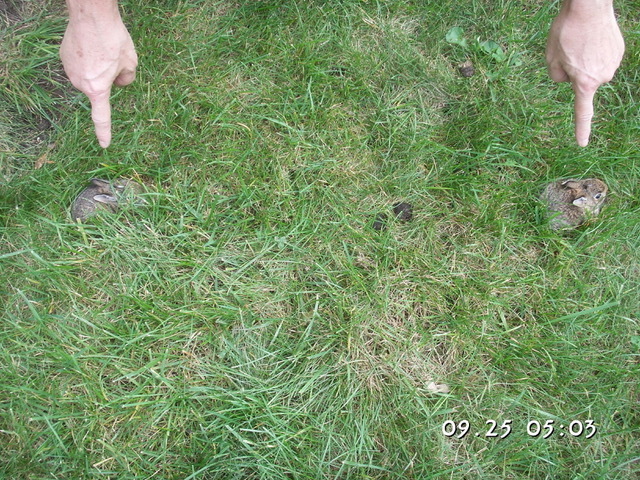 They dig the ground to bury their loot and destroy the grass lawn. 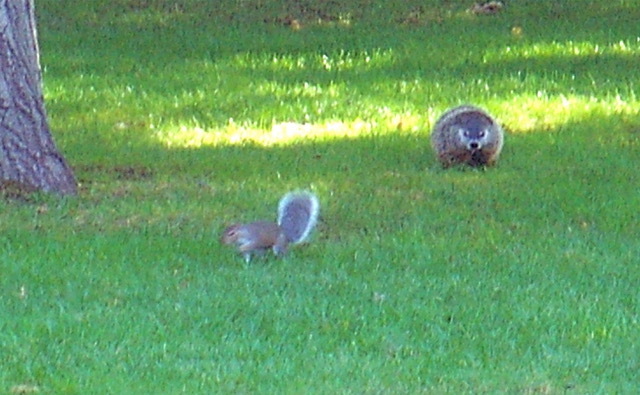 Another resident of our backyard are the groundhogs. 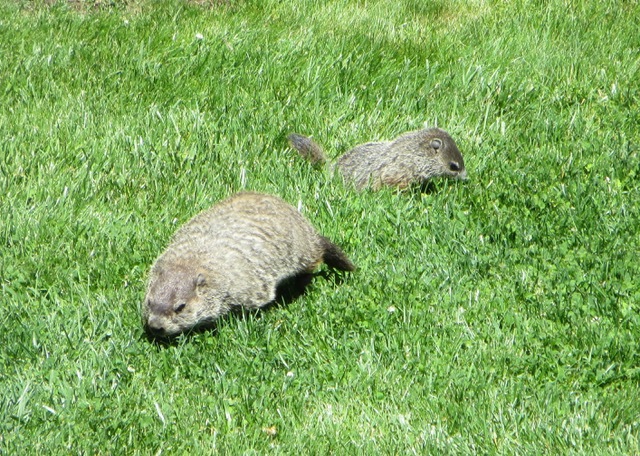 Sally watched this groundhog eating by the entrance to its burrow under our neighbor’s shed. A mother taught her pup how to make a living. 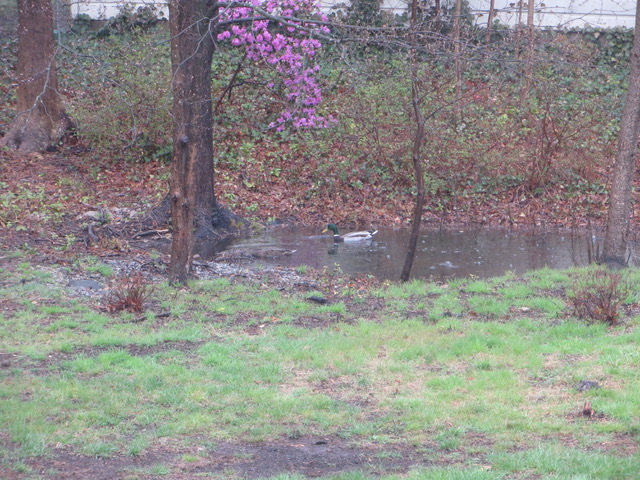 In the wet Spring, water from our sump pump create a puddle that I named Rosal Pond. A couple of ducks used it as a temporary resting place during a rain. 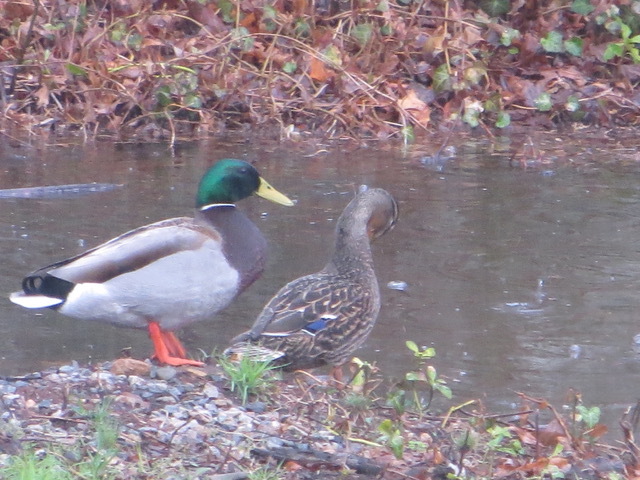 The ducks rested and groomed by the water. 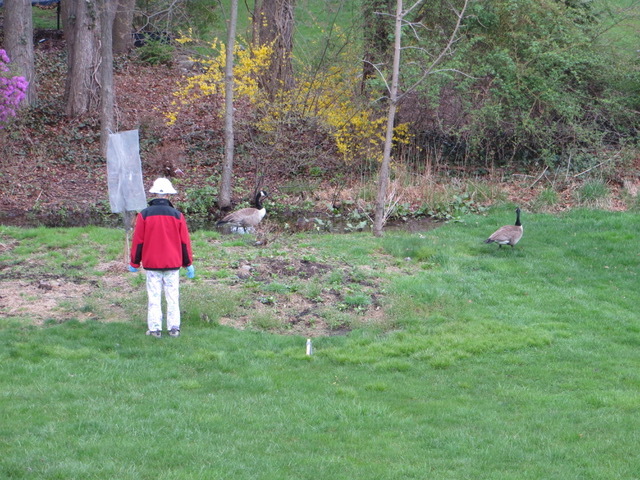 Canada geese also lingered at Rosal Pond. They ignored Sally even as she approached them. We have other lovely resident birds. 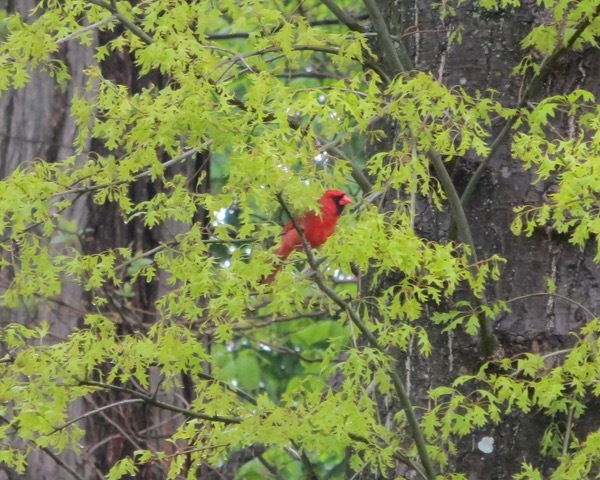 This is a fire engine-red cardinal. This blue jay is another colorful sight to see. 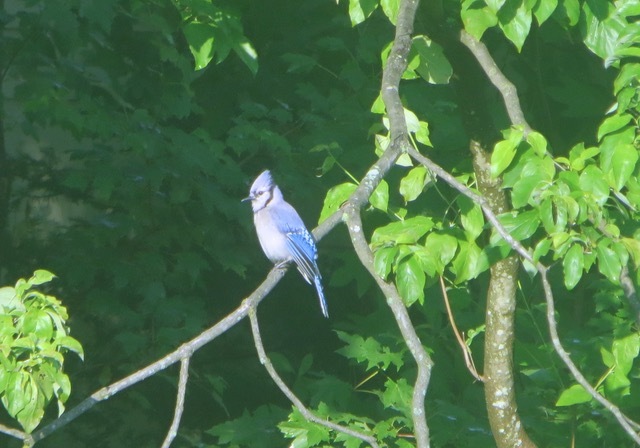 The blue jay was screeching loudly. 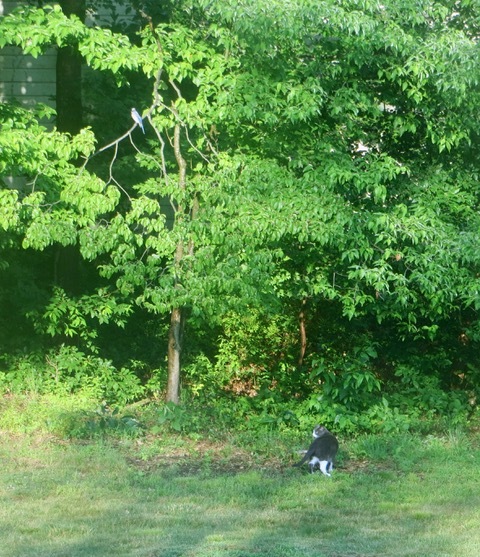 I paid attention and saw our neighbor’s cat prowling on the ground. Domestic cats are the scourge of small wild animals. They kill what they can catch and decimate populations. 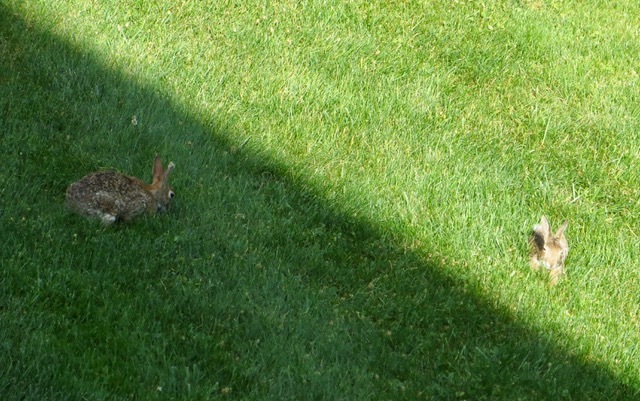 Another resident animal are the bunnies. I call these two the yin and yang bunnies (隂陽). These two bunnies were very attached to one another. They stayed close together and foraged for an hour. They had no apparent fear of any predator. 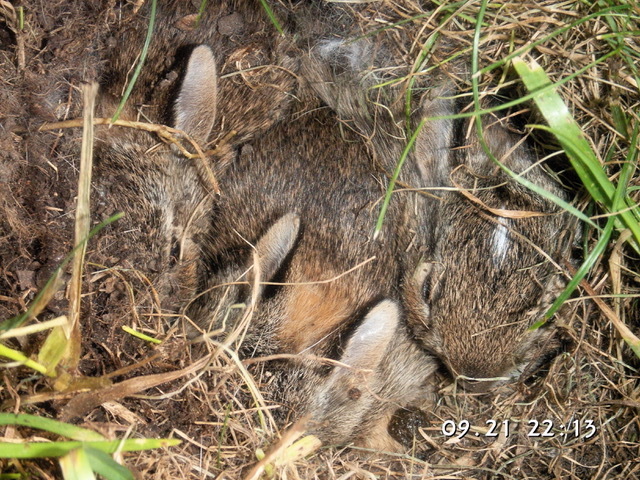 We found new born bunnies hiding in our lawn. 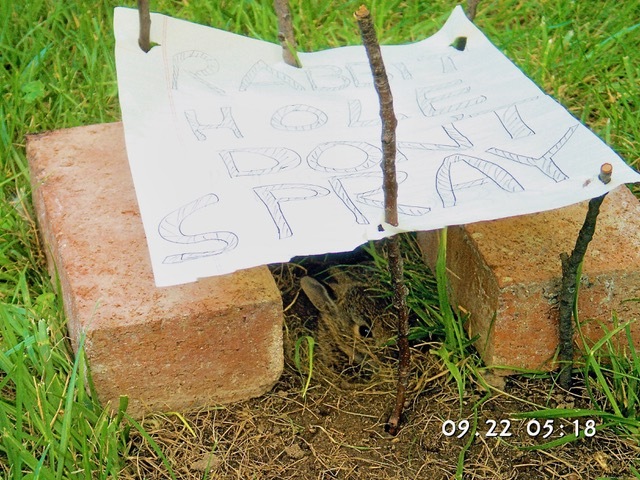 To protect them from lawn mowers and spreading weed killer, I placed two bricks around them and posted a notice. 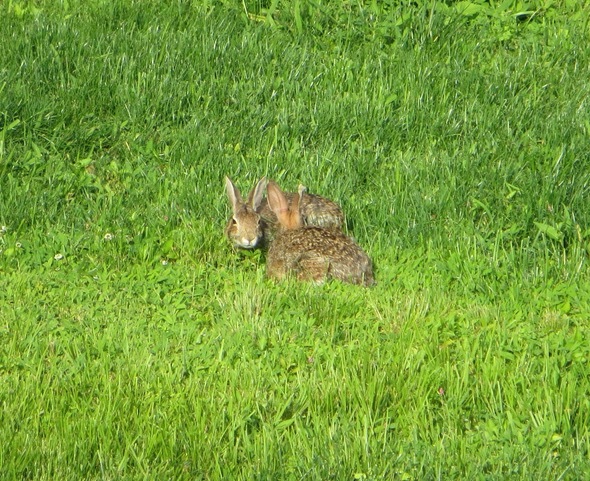 A few days later, two young bunnies left their nest. 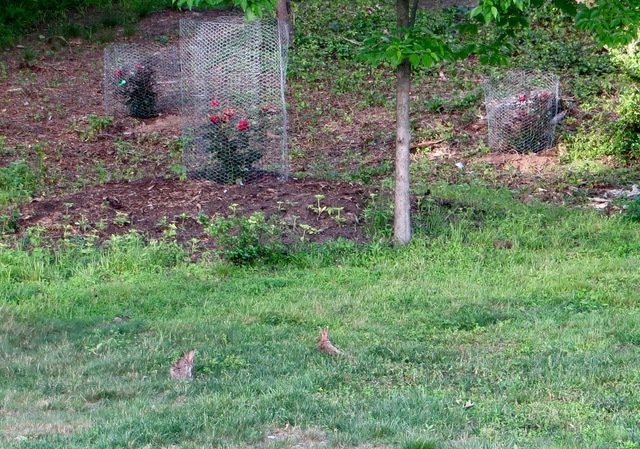 By their nature, baby bunnies stay put and hope their stationary camouflage would save them from predators. 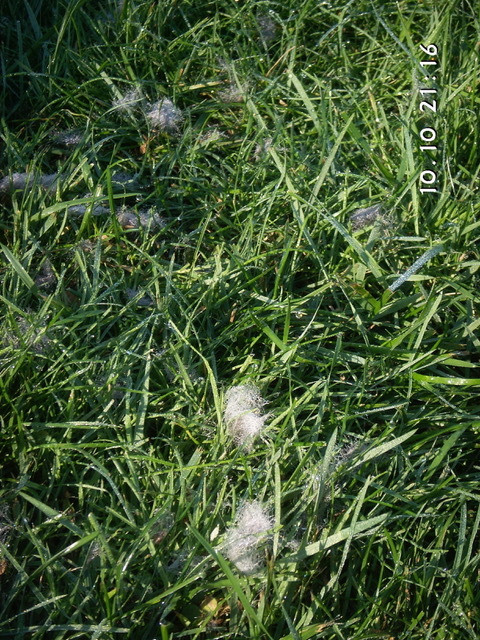 Still later, I found tuffs of fur on the lawn. I hope they were not from the bunnies. Predators roam our neighborhood. 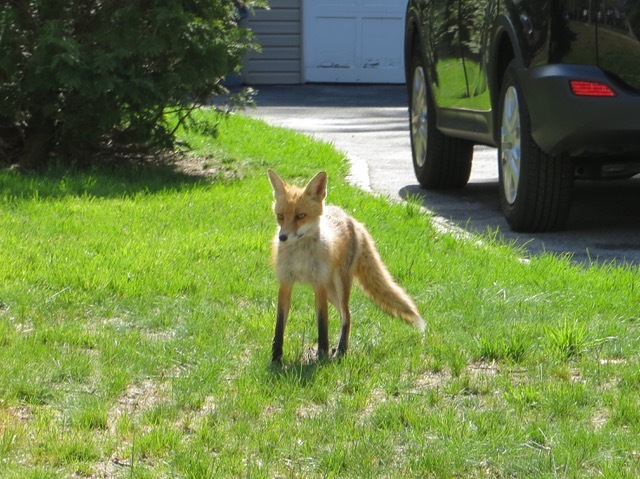 This fox was spotted. 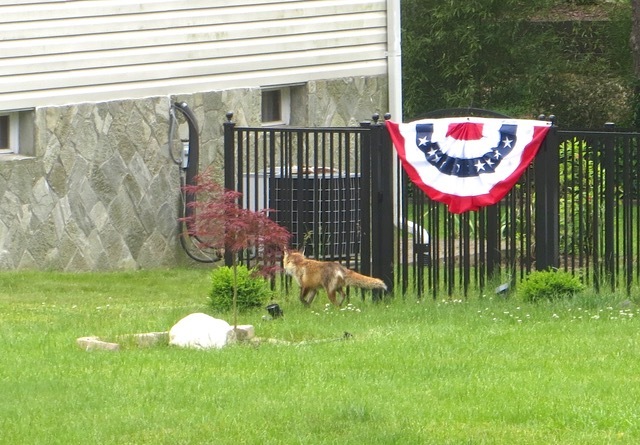 The fox was looking for an easy meal. But the cycle of life continues to roll. 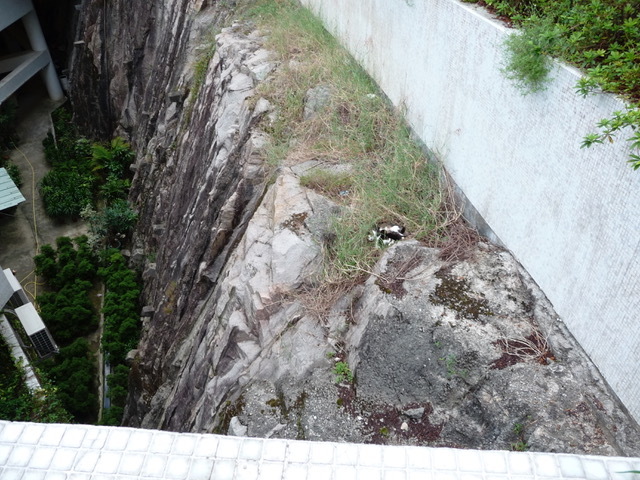 When we were living in Hong Kong, I found this family of feral cats on an inaccessible ledge near our apartment building. 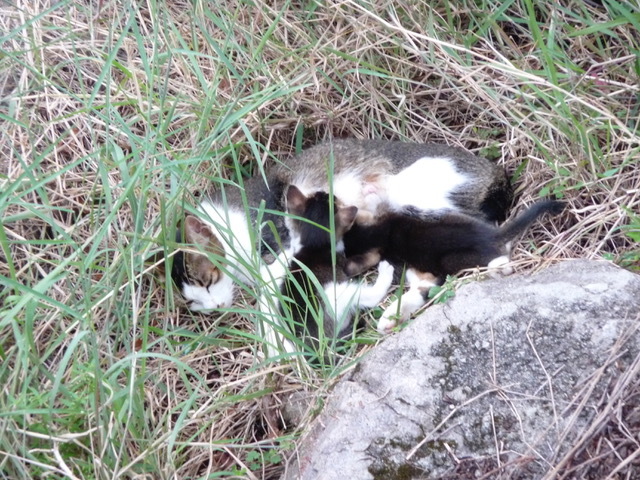 Upon closer inspection, I was delighted to see a mother cat nursing her kittens. Animals living among us have adapted to the environment and have found their ways to survive and thrive. Posted by Robert Wu on Monday, June 18, 2018, at 1:16 pm. Filed under Uncategorized. Follow any responses to this post with its comments RSS feed. You can post a comment or trackback from your blog.